I left the hospital and since it was Thursday we decided to go ahead and do my food shopping. Do I really have to admit I was stupid enough to carry a couple of the bags in my right hand coming out of Dollar Tree and the whole stent cast came off the finger and so we went running back to the hospital? 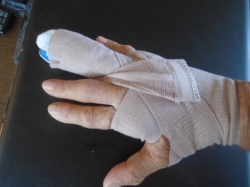 Another long story short:after Lori affixed the new splint and told me—like she was talking to a child, deservedly so—to NOT use my right hand. I had to get a pain killer prescription filled along with one for anti-bacterial pills but by the time we got to Winn-Dixie their pharmacy was closed so we went running off to CVS. Another long story short: they could give me the anti-bacterial pills but they would have to order the pain killers and wouldn’t get them until the morning. At first I thought great because CVS delivers meds before I realized that with the new Florida Laws they are not allowed to deliver narcotic pills, that they have to be picked up by the patient or someone with a driver’s license. Yep, guess what? Another long story short but to make it shorter Friday was movie going day so Allen would pick me up we would go for the pills and then to the movie! The following Tuesday, March 22, I would go to my primary doctor who would change the bandage, take a look at the wound and then I would go to the hand surgeon’s new office on Monday the 28th and he would take the stitches out and/or would????? I didn’t know. The finger wasn’t hurting too much and the pain-killer tablets seem to be doing okay but no way—and I am not ashamed to admit it—was I going to look at and/or change the bandage. The surgeon ‘s office called me and changed the appointment to Friday April 8 but I didn’t want to wait that long so I decided to go back to my primary and then go to the surgeon’s new office when it opened which would be on March 29th. About the new office—I was impressed with the outside of the building and was even more impressed with the new offices when I went in—but that was before I heard the decision I had to make that Tuesday!! !